THE CANADIAN PRESS — When most people envision a day at the beach, it doesn't generally involve dragon boats or a multimillion-dollar piece of military hardware. Of course, most people aren't the future king and queen. The Duke of Cambridge traded navy blue for drab olive Monday when he donned a flight suit to practise a quintessentially Canadian manoeuvre — landing on the water — during a royal visit to a seaside resort in Prince Edward Island. Story continues under this slideshow, which will be updated all day.. The couple ended the day by flying to Yellowknife, where a couple hundred people greeted them under grey skies and a light drizzle. After leaving the plane, they were presented with flowers by a pair of eight-year-olds, Marco Polo Esteem and Amelia Wood. "I was a bit scared," allowed Marco. "But then I got to it and I wasn't nervous." Earlier, in Dalvay by-the-Sea, Prince William and Kate grabbed paddles and life vests for a dragon-boat showdown that left William a fairly drenched victor and his wife with more than one faceful of paddle spray — a cautionary tale about sitting in the stern. When it was over, Kate playfully gave William a shove, as if to push him in the water. "Sadly, we lost," she said, laughing, to Christine Dapart, one of the spectators in the crowd as the royal couple made their way to a pavilion where regional performers were on hand to demonstrate Celtic and Acadian dance and song. "They seemed very down to earth, just like us Islanders," said royal watcher Priscilla Morrison, who was on hand for William's piloting demonstration at the Dalvay by-the-Sea resort on the island's north shore. The good-spirited royals were utterly unfazed when the traditional Maritime weather showed up, sprinkling both them and the throngs of fans and well-wishers as they shook hands, sampled island fare and sniffed the smoke of a traditional smudging ceremony. "They seemed to just fit in with the crowd and were mingling with young and old alike," Morrison said. "It was great to see them here. They had a smile for everybody, even with the weather. They're very good sports." The royal couple watched beach volleyball, inspected sand castles, posed for photos and tasted P.E.I. beef with sweet onion marmalade, lobster and potato chowder, pork and beef belly and strawberry shortcake. And in one of the most anticipated moments of their island visits, they met with Tess Benger, who plays the iconic Anne of Green Gables in the popular stage show of the same name. Kate is a longtime fan of the famous books by Lucy Maud Montgomery. Benger, 23, was clad in her character's signature red braids and straw hat as she handed over a copy of the book. Kate told Benger she intended to read it again. "She said that she totally wished that she could see the show, but that they don't have time and to break a leg on the show," Benger said. "They're really lovely, really wonderful people ... it was really exciting." It was William who got their afternoon on the water off to a very literal start. Swapping his crisp jacket and tie for a jumpsuit and helmet, he climbing into the co-pilot's seat of a grey Sikorsky CH-124 helicopter and plopped it down repeatedly on the surface of Dalvay Lake, hard by the edge of the Gulf of St. Lawrence. A trained helicopter pilot, he spent nearly an hour perfecting the Canadian-made "waterbirding" move — sometimes turning circles on the water like a giant mechanical duck, windshield wipers clearing the spray from the windscreen, or performing a touch-and-go exercise that at times pushed the water levels nearly to the windows. His official spokesman said the duke would take the technique home with him, where — as a flight lieutenant with the Royal Air Force — he flies a Sea King as a member of the British military's Search and Rescue Force. "The Duke of Cambridge is, first and foremost, a search-and-rescue pilot — that's his job and it's a job he's very proud to do," said press secretary Miguel Head. While waterbirding isn't widely practised outside Canada, it's a manoeuvre that's known to search-and-rescue professionals and helicopter pilots around the world, he added. "So when (William) took the decision to come to Canada, one of the things he actually asked to do was to do this, and it's a technique he'll be able to use in his job." Following the Sea King demonstration came a real battle royal — William and Kate racing with their own crews aboard separate dragon boats. The duke put his back into it, paddling in perfect unison with his crew, while Kate laughed off more than a little lake water. Immediately after the race, the duke and duchess took part in a cultural display that included a traditional smudging ceremony, traditional Mi'kmaq drumming and an Acadian dance performance. In between demonstrations, the royal couple graciously made the rounds of the well-wishers, shaking hands from under a pair of umbrellas. At a demonstration of search-and-rescue techniques on the Canadian Coast Guard ship Edward Corwallis at nearby Summerside, the pair chatted up members of fishing crews who have been rescued in the past. They watched from the deck of the ship as a technician was lowered into the water to "rescue" someone from an overturned fishing boat. Stiff winds buffeted the spinning, swaying pair as the hovering chopper hoisted them up. Summerside resident Charlene Campbell, 76, greeted William with an old newspaper clipping that featured a photo of him as a baby with his mother. "I wanted to give it to him because he was just such a sweet little baby," she said. Earlier in the day, the cradle of Confederation was teeming with smiling faces young and old as the couple began their day at the site of the Charlottetown Conference, which laid the foundation for Canada's birth. Thousands of people, many of them having spent the night outside, were gathered at Province House, P.E.I. 's legislature and the site of the historic meeting some 146 years ago. A sea of small Canadian flags had gathered beneath slightly overcast skies to catch a glimpse by the time the duke and duchess arrived — Kate in a cream dress by Sarah Burton at Alexander McQueen, William his traditional blue suit with a burgundy tie. "It is quite a moment for Catherine and me to be standing here in the Atlantic Canada, in front of Province House, where Canadian federation was forged," William told the enthusiastic, cheering crowd. "Here, in the crucible of Canadian nationhood, we look forward to meeting many of you." Premier Robert Ghiz introduced William, announcing the establishment of a scholarship fund in the name of the duke and duchess. 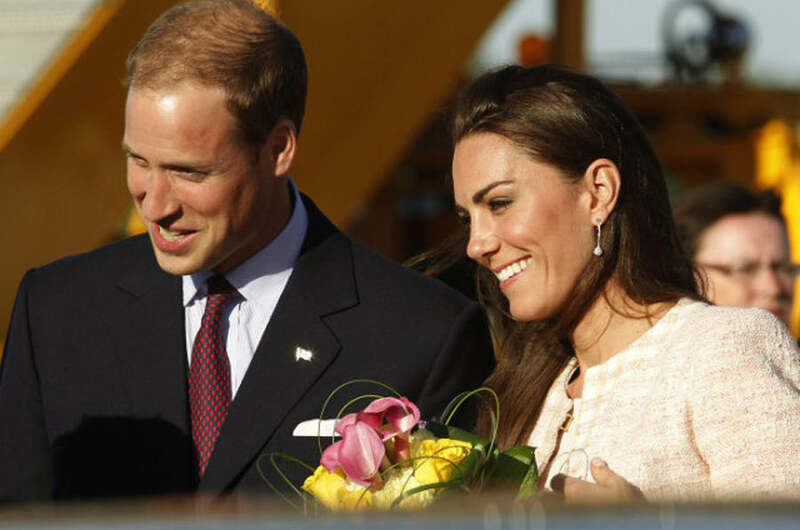 "We have both so looked forward to this day, and discovering more about your beautiful island," William said. "We are also delighted that you have chosen to inaugurate a scholarship in our names. Thank you for this wonderful and generous welcome." From there, the duke and duchess split up and began working the crowd, shaking hands with the many spectators pressed up against the barricades along the street, utterly unfazed by the spitting rain that began to fall. The crowd was ebullient, calling out their names, waving and clapping. The route was lined with handmade posters. Kallie Haines, 23, arrived with a friend at 6 a.m. and got a front row seat. The pair wore T-shirts that said "I love William and Kate." "She looked right at me and we got great pictures, so it was really exciting," Haines said. "It was a bit overwhelming." Lilly Gillespie, 11, screamed out Kate's name and gave her an early 1937 edition of "Anne of Avonlea." "I was really nervous," Lilly said moments after handing her the blue book. "She said, 'Thank you, I love "Anne of Green Gables" and I'll read this book right when I get back to England.'" Jennifer Thomson, 26, had a more brazen request of the duchess — she had a poster saying, "Kate, can I borrow your outfit?" "I think she's setting a new fashion trend and I personally love them and would love to wear them," Thomson said. It was important for the couple to come to Canada, she added. "I think it will only strengthen the ties between Canada and England and the monarchy." With a gentle rain falling, the duke and duchess climbed aboard their open-air landau, a choir singing in the background, for a short procession down crowd-lined Great George Street towards the waterfront. Once there, they took in a brief musical theatre performance of "The Talking Stick," which tells First Nations stories from across the country, before climbing the stage to greet some of the performers. That was followed by another mad scrum of hand-shaking and picture-taking with the legions of fans gathered by the shoreline.